ThinkGeek, maker of several other geek toys of varied usefulness, has released a new attachable joystick for the iPad or Android tablets. By attaching to the glass, it will work with any game with any graphical control pad (such as many of the iOS versions of Pac-Man that are out there). 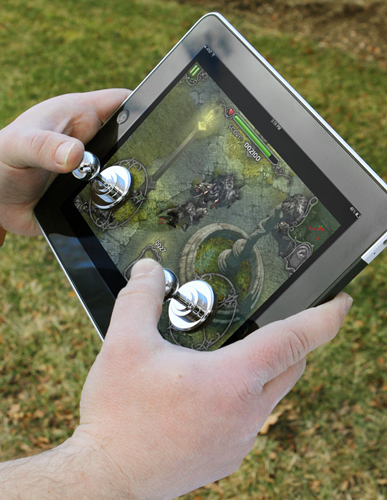 Bring your tablet-based gaming to the next level with the JOYSTICK-IT Tablet Arcade Stick. The JOYSTICK-IT gives you a real physical joystick for increased precision with touchscreen based games. The JOYSTICK-IT will work with any game that features a virtual on-screen control pad of some kind. Games that use swiping, swipe-style joypads, joypads with variable on-screen locations, or complex finger based gestures will not work properly with the JOYSTICK-IT. ThinkGeek is a nerd sanctuary for cool things. It sells basic geek-themed goods like shirts, hoodies and Android plush robots; as well as more elaborate ones such as an add-on flip-out keyboard for the iPhone and an iPod speaker that looks like a lego brick. Hopefully this add-on will help boost your high score. Happy gaming!